It was in 1969 that the name of Peter Roebuck first came to my notice. Bill Andrews was County Coach and was always bringing in another Peter May or a Fred Trueman, this time it was the new Richie Benaud. Peter had taken his eye at school as a very promising leg spin bowler and Bill gave him his Minor County debut at Instow, at the age of 15 years 7 months, I should think making him the youngest Minor County player ever. 1990 sees us drawn against Devon in the NatWest Trophy. Could it be that Peter will be facing Doug Yeabsley 21 years later? It was 1973 that Peter, along with Ian Botham, Vic Marks and Phil Slocombe started to come to the fore and all joined the staff in 1974; there was always a bit of rivalry between Peter and Phil, going back to their school days. 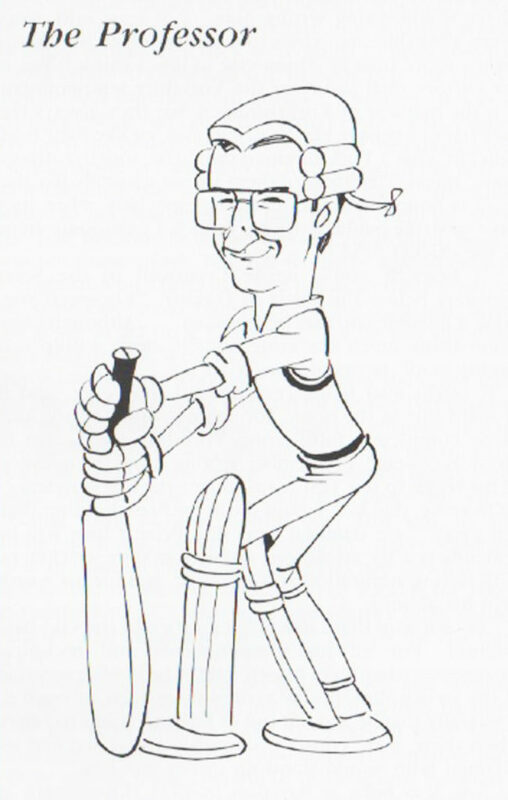 In 1975 Peter went up to Cambridge and combined his cricket and Law Studies very successfully, though I could not see him as a ‘Marshall Hall’ or a ‘Rumpole of the Bailey”. 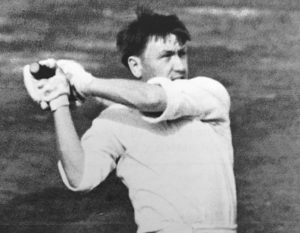 I am sure, like many a bowler has found, he would have been hard to beat. Peter has always preferred his own company in the evenings rather than drinking in the bar. It’s been said of him in the past by one or two team members that he was too bright and does not know how to relax. Life can be difficult sometimes when you’re always one page ahead of the teacher. 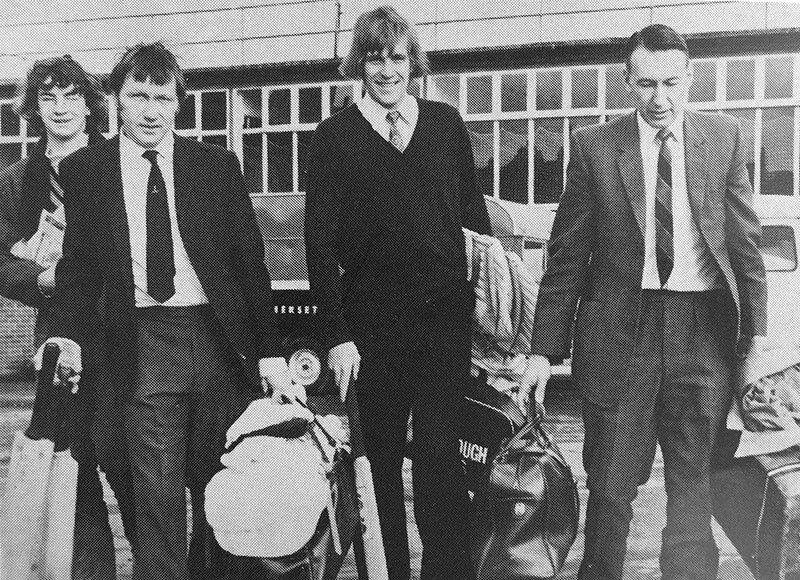 In the early days Peter would take failure with the bat very hard and on the odd occasion his passenger could find himself looking for a lift to the next match. For many years Peter’s love of the Weston Festival was as much as one of the donkey’s on the beach on a wet Monday in August. Peter felt he could never score runs, which is something the records prove otherwise. Way back as far as 1977 Peter scored a hundred at Weston, and in the following match at Taunton against Essex,he had the respectable bowling figures of 2 for 65 off 22 overs, the wickets being that of Gooch Denness, but a week later he found himself once again at Instow, the reason only known to Brian Close. The match against Devon started on the Friday, the First Team had a match with Gloucester starting Saturday. Brian Rose declared himself unfit at 10.30am. I was once again summoned from the roller for the fourth time in four years. Both Phil Slocombe and Peter were very angry when they arrived back in Taunton; that decision could so easily have lost us two very good young batsmen. Though playing his part in the success of the late seventies – early eighties, 1982 was a poor year by his standards. He then set about analysing his game and worked hard at what he saw as his faults; it was certainly a case of ‘physician heal thyself’. I feel his great season of 1984 was the reward for all his hard work. 1987 will also go down as one of his best seasons, to perform so well after so much has been written of the Club and himself was a real test of his character. It was as his journalistic career blossomed that I feel he became a more outgoing person though still rushing home after the game to write an article and cook his pork chops. Peter is always rushing off at the end of a season; in a year that has taken him to Sydney, Khartoum, Johannesburg and Delhi, I thought it quite amusing when he rang me one evening to ask which road he should take to Williton! Reporting for Nets in April 1973 with Peter Robinson, Bob Clapp and Tom Cartwright. The events of 1986 and being in the world of journalism has tended to overshadow his many fine performances. Who will forget that last over against the Combined Universities in the Benson and Hedges quarter final, in 1989? Peter has undertaken to write the history of the Club. I have no doubt the chronicles of the second hundred years, will find Peter as fascinating a subject as he has found the Somerset legends of the past. I hope his wish to walk out to bat in his straw hat in his last match at Taunton is a long way off.